There's a system for determining whether or not your magical gizmo still works or not that I read somewhere some time ago, and that I rather like. Rather than giving it a set number of charges remaining, you assign to it a die — anything from a d2 to a d1,000,000,000,000. 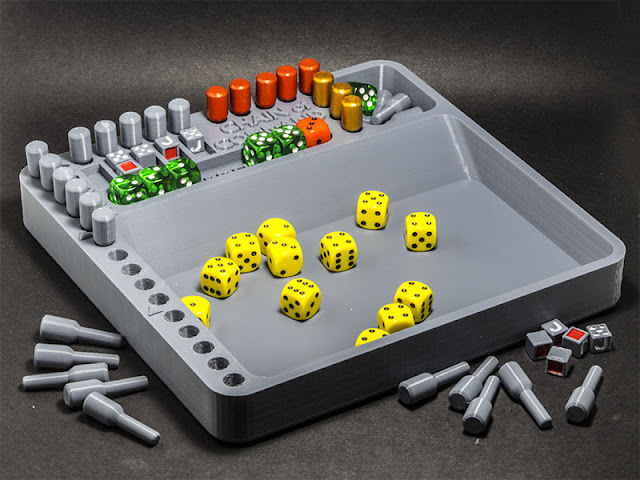 Every time the macguffin is used, the die is rolled: if a 1 turns up, it fizzles, fails to operate, and is out of charges from that point. First, it adds a degree of uncertainty to the use of magical gew-gaws. I don't imagine them coming with a little read-out showing exactly how much fuel is left in the tank, and I don't think the characters using the thing should have that information either. Second, it reduces the amount of record-keeping that either the player or the GM has to remember to keep track of. The easiest thing, from the GM's point of view, is to just let the player know which die they should be rolling to activate the thingumajig. The down-side to that (if it is, in fact, a down-side) is that it gives them some information about the state of charge of the doohickey. The slightly more tiresome method is for the GM to secretly roll the die every time they attempt to use the framistat. 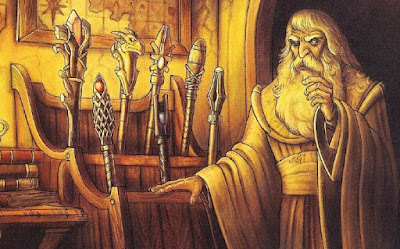 The possibility here is that an unscrupulous GM might take advantage of the secrecy to remove from his or her campaign a magical splandlefloopit that is causing them irritation. My personal choice would generally be the former, but that's mainly because I'm really very lazy. 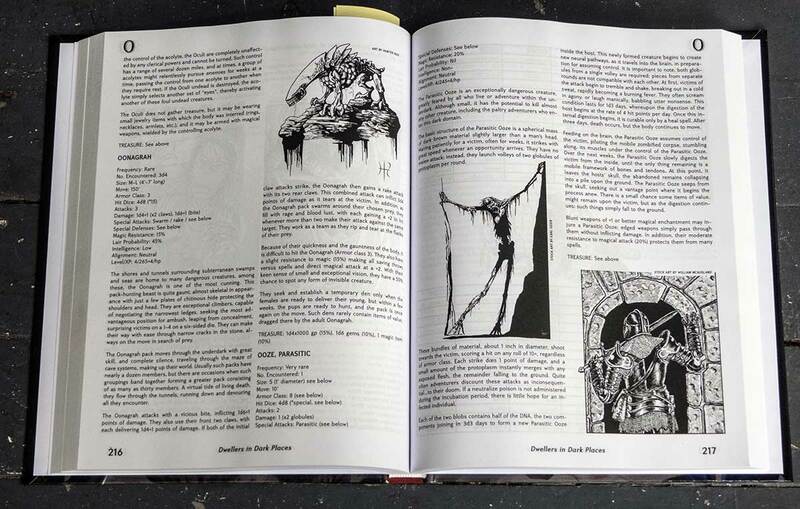 This book of monsters for AD&D/OSRIC by Matthew Hargenrader, Dwellers in Dark Places, has just arrived on my doorstep — at long last; I ordered it from DriveThruRPG a couple of weeks before Xmas last year. I bought it in PDF format some months before then (about September, I think) and enjoyed it enough to shell out for the PoD hardcover when it was marked down (about 20%) for the pre-Xmas market. It is, without doubt, the most entertaining book of RPG monsters I've seen in decades. I haven't enjoyed a critter collection as much since I got my brand new copy of the Fiend Folio in 1982. It's thoroughly illustrated in black-&-white throughout, and generally, the illustrations are pretty good — to my mind, they're of a much better standard than the usual run of fan-published work. There's something to be said for the enthusiasm of amateurs, but it's refreshing to see such a solid body of professional-quality black-&-white artwork. There's nothing there, alas, by Pete Mullen (one of my favourites), but I guess you can't have everything. 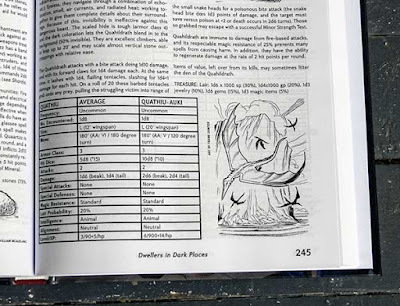 There are about 500 monsters detailed in the book, and almost (?) all of them have at least one illustration, so that's a lot of pictures. The paper is a bit thin, and not terribly opaque, but considering the page count (366 pages, not counting the front- and end-matter) if the paper was as heavy as that in the first Monster Manual and Fiend Folio, the book would be about two or three inches thick. Not that I'd particularly mind that. The organisation and layout follows the precedent set by those earlier works, though in places it betrays a certain amateurishness. The most obvious example is in the tables that are scattered liberally throughout the book; they are all dominated by thick black borders which overpower the text within, and make the whole table less legible. 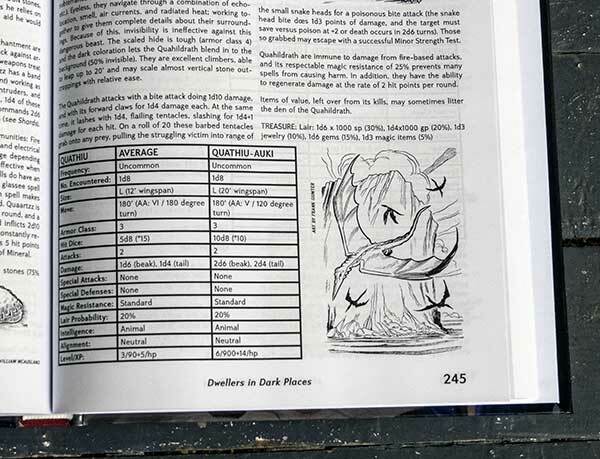 Another example, and a more serious one from the point of view of the book's usability, is that all too often monster statblocks and descriptions/illustrations are spread across more than one page. That's not really an issue as long as they're on the same two-page spread, or at least start on the same spread, but frequently I see a statblock table on a right-hand page that refers to a monster that is detailed on the following page — and that description is lacking any sort of title or visual separation from the previous entry. That's just bad design. However, even with these reservations, I like this book a lot. 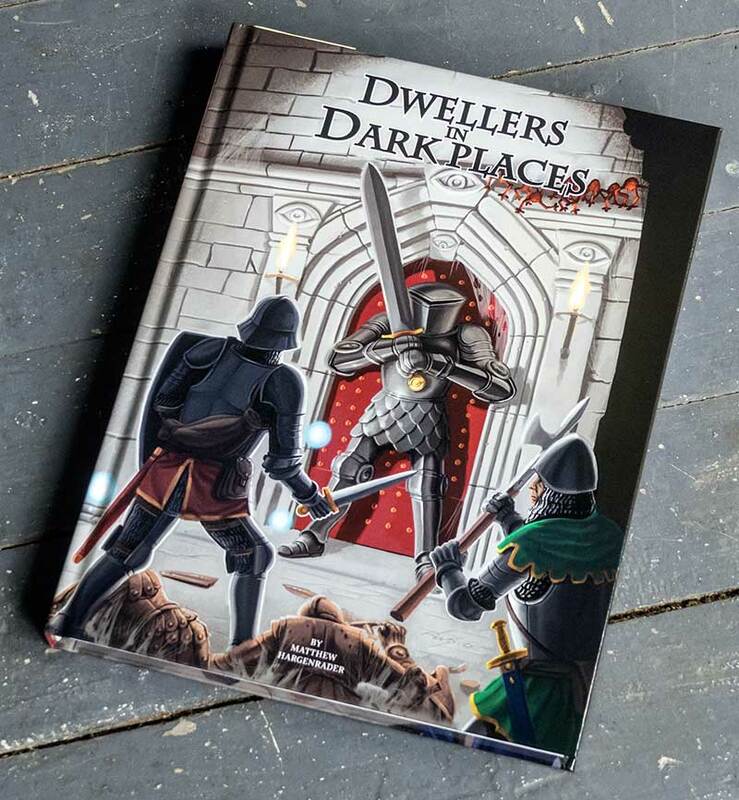 It has obviously been a labour of love for the author, and it's jam-packed full of critters that I'm champing at the bit to use. I hope it makes him a MEEEELLLION DOLLARS! These also arrived today, in a separate delivery: ten 24-sided dice from the faraway land of China. 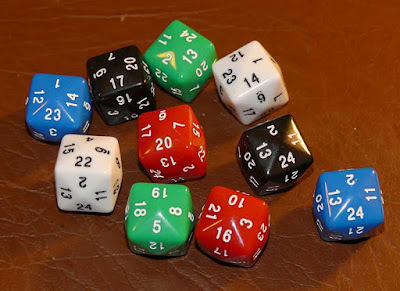 I've made my love of Stupid Dice known before. I can't foresee very many uses for these, except maybe to randomly determine an hour of the day, so you'd think there would be no point in getting more than one. Or even one, for that matter. Ten certainly seems like overkill. However, they were only about a buck-fiddy for a bag of five, with free postage, so really I think I should be congratulated on my self-restraint in only getting ten. 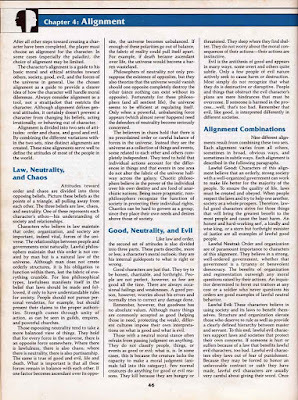 I was idly leafing through one of my old AD&D 2e Players' Handbooks and feeling that its layout, it's look-and-feel, were really boring and old fashioned. It's true that the layout is staid, to say the least, but it was more than that. Then I put my finger on it: the blue bold serif headings and the blocks of conservative Times-Roman-like text make it look like a web page from 1995. All that's missing is <blink> and <marquee>. On the cover, there's a TSR logo with the tagline "Products of your imagination". This sort of layout does not reflect much in the way of imagination at all. It might as well be an engineering reference manual. It does have the occasional illustration, but they're mostly pretty crap. An argument might be made that keeping everything as neutral as possible is a good thing, as it would be less likely to unduly influence the imaginations of the users in any particular direction. This layout fails at that as well, because of the general focus and tenor of the aforesaid lame illustrations. They influence the imagination without particularly inspiring it. I felt, at the time that it was released, that there was quite a lot about 2e, mechanically, that I liked as compared with 1e. 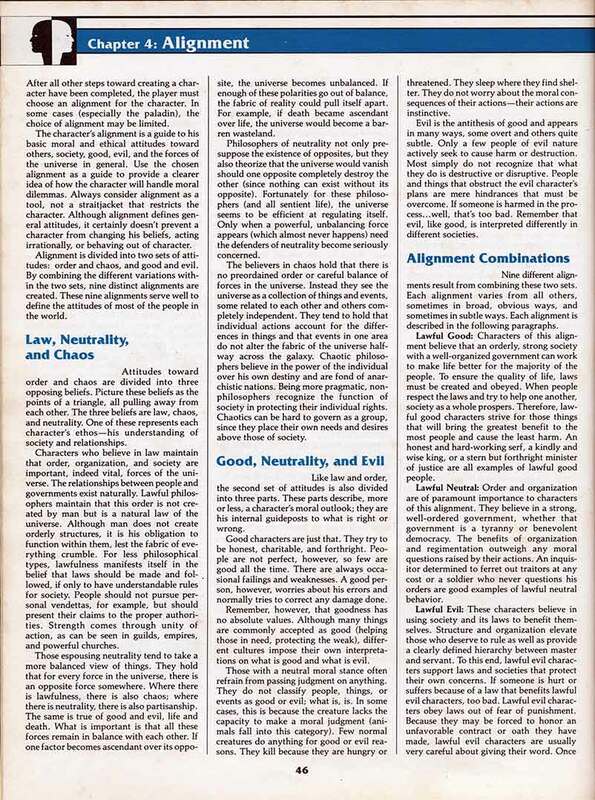 But I thought at the time, and still do, that it lost a lot of the heart and soul that 1e had had in spite of its frequent clunkiness.